Harmonic enhancement HarmoniEQ applies to the sound is an inherent element of its overall sonic quality. HarmoniEQ also features dynamic equalization modes that offer you a vast palette of sound-shaping capabilities, suitable for mastering. 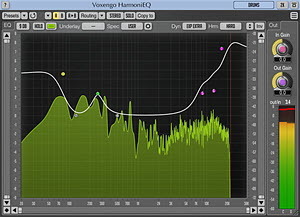 Since the easiness of tuning was one of our goals when producing this plugin, HarmoniEQ features a single control surface to control the equalizer curve. HarmoniEQ's control surface workflow implements our best findings in the area of “user-equalizer” interaction. Just drag the filter control points to the right places. You can enable up to 7 parametric filters, with the filter type freely-selectable from peaking, low-shelf, high-shelf, low-pass, high-pass and notch filter types. Version 2.4 is a free update for existing customers. Voxengo HarmoniEQ is available for purchase on-line for USD 69.95.